The Blue Guide dates this mosque, at least in its present form, between the mid-8th century and mid-9th century AD. It is a mosque for congregational worship, with a peristyle courtyard. Read this photo from left (north), to right (south). The mosque is seen here from the west side; the front, and longer (sic), side of the building is north (plan). From the columned entrance (1), worshipers passed into a large rectangular courtyard (2), and continued through another row of columns and into the first prayer hall (3). Past yet another row of columns is the inner prayer hall, with a mihrab on the south wall (4). The dimensions of the mosque are approximately 30m (N-S) by 50m (E-W). 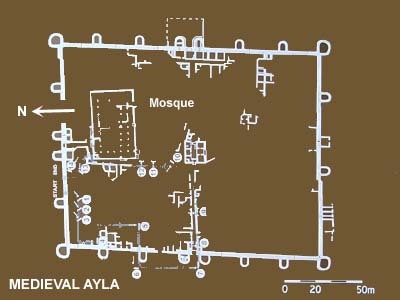 Medieval Ayla is located on the beach of modern Aqaba, Jordan's port on the Red Sea.